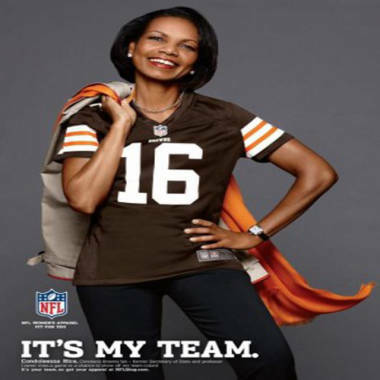 Condoleeza Rice in the NFL's women's apparel campaign. When it was whispered that Condoleezza Rice was being considered as the pick for the Republican vice presidential ticket alongside Mitt Romney, the former Secretary of State denied it strongly. Maybe it wasn't due to lack of interest, but because she's taking time off from the political arena to focus on her new career: modeling. The line is launching just as both the Fashion Week season and football season heat up, two worlds that have become more and more intertwined. And now, ladies who are a fan of both can be fashion-forward at the stadium and beyond. Former Secretary of State Condoleezza Rice (far right) models in a new ad for NFL merchandise. But others voiced support, like one who tweeted: “Condoleezza Rice is in the NFL women’s apparel ad! Along with some other great female role models! Hands down, favorite so far.” And one Facebook user, Amy Vojta, said on Rice's Facebook page: “I might disagree with your politics, but I totally support your love of the Browns! Go Condi!” Demonstrating that sports fandom really does transcend party lines. 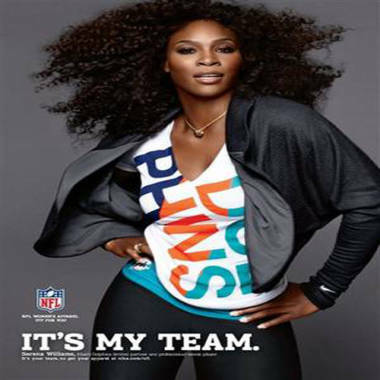 Serena Williams also models in the NFL's women's apparel campaign. And cultural ones. Fashionistas have their own poster girl in the campaign, in the form of New York Jets owner Woody Johnson's wife, Suzanne Johnson. She’s a self-confessed “Hermès girl” and she brought her own accessories to wear for her campaign shoot. She insisted her bag be included, saying it was what she would actually wear to the stadium. However random the fashion-football synergy seems, we should’ve seen something like this coming, especially since women account for nearly half of the NFL fan base. According to NFL.com, the league's vice president of consumer products, Tracey Bleczinski, said: "Forty-five percent of fans are female and that continues to grow. We do have something for everyone, and this campaign aims to communicate that if you are living and wearing football, you can do it every day, year-round." And did we mention how well it'll go with your Birkin?